My love of Guillermo del Toro started with Pacific Rim. The movie exceeded my expectations in every way. I went into the movie expecting something like Transformers Meets Godzilla and emerged astonished. Sure, there were robots and monsters galore, but they weren't just robots and monsters. They were Jaegers and Kaiju. Teamwork versus other-dimensional aliens. The movie broadened my view of storytelling and became one of my favorite films of all-time. Let me tell you why. • Gullermo del Toro always finds room for well-rounded characters and character development, even in the midst of an epic battle between monsters and machines. Colorful, three-dimensional characters abound. Becket is a disillusioned young man whose life as a Jaeger pilot was destroyed when his brother was killed alongside him. Mako is a quiet, eager young woman who desperately wishes she could help fight but accepts her adopted father's wishes that she stay off the field. Stacker is a noble leader trying to keep the world from destruction. Doctors Newt and Herman have a sarcastic camaraderie you'd be hard-pressed to find even in a typical 'brothers in arms' movie. Even the other Jaeger pilots are creative, colorful, and frequently deeper than you'd expect. • There's actual story to this story. It isn't just machines and monsters beating one another into a pulp - the movie has heart. It's about sacrifice and friendship and loyalty and doing the right thing, no matter how hard - or fatal - it may be. It's about learning lessons and being the best person you can be. 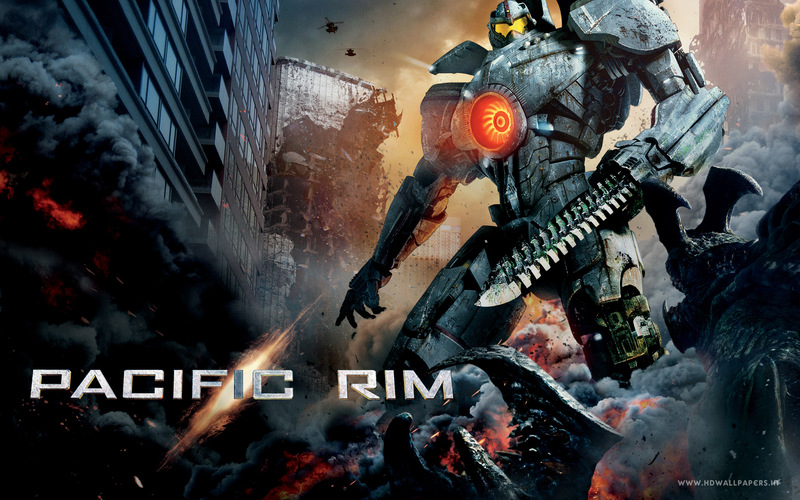 • The humor is a beautiful thing in del Toro movies, and Pacific Rim is no exception. Whether it's Becket's adorable puppy-eyed expressions, Herman and Newt's back-and-forth snippy friendship, or the small touches like the post-credits scene, the movie holds a strong sense of humor all the way. • The design and special effects are incredible, in no small part to del Toro himself. He insists on having things be as real as possible, which means most of the sets and Jaegers are in fact actual props and not just really good CGI. Plus, he's an extremely involved director and cares about even the smallest thing, which is why the amount of detail in his movies astounds me. • The sheer coolness of this movie is hard to resist. Unique, enormous robots fighting giant, florescent underwater alien-monsters? With swords? And ships? How can you say no? • The soundtrack is incredible. Ramin Djawadi created themes that make you want to go out and take down some monsters yourself. I'm listening to the score as I type this, and I'm definitely ready to go kill some Kaiju. How about it? Are you interested in Pacific Rim now? Have you already seen it, and if so, what do you think? Are you as upset as I am that the sequel was shelved? (INJUSTICE!!) Let me know! I'm definitely intrigued after reading this post. This is solidly on my TBW list. I love this film. I need to watch it again. It's truly glorious & underrated. The characters were awesome, the fighting was epic. It sounded weird at first, but it's totally better than Transformers & Godzilla. (though, Godzilla was cool too. Just not Pacific Rim cool.) Everybody go watch it.